Who knew cribs and baby beds could be political? Most people aren't aware that baby goods manufacturers, just like most other industries, have lobbyists in Washington, DC who advocate for the manufacturers when the government is deciding laws and regulations. In the past decade we have seen sweeping changes regarding cribs in the US. Yes, the good old drop side crib has been banished. The drop side design itself is not the problem. Drop side cribs were the standard in the US since the 1940's and it was common that cribs were handed down from one generation to the next. Just like cars, changes are necessary to keep people safe. In the 1990's manufacturers began making changes to save money. Thus crib slats began being stapled or glued in place rather than nailed or inset. Drop side hardware parts changed from metal to plastic or nylon. In the 1990's we saw the appearance of the "tools free" snap together cribs with all hardware being plastic and an assembly time of about 10-minutes tops. Hard wood was replaced with cheaper, softer wood. However, over time manufacturers discovered that making small changes in manufacturing resulted in larger profits. Due to breakage and separation, many cribs were highly dangerous to infants posing entrapment, fall and strangulation hazards. Following many reports of child injuries and deaths, consumers began demanding safer cribs. In 2010, the CPSC in conjunction with ASTM and JPMA acted on the huge volume of consumer complaints, as well as hundreds of infant deaths and injuries, with a sweeping overhaul of crib regulations. Crib manufacturers lobbied for a total ban of drop side cribs, instead of recalls. The reason? You guessed it, money. Had there been recalls, the manufacturers would have been responsible to provide acceptable replacement parts or offer a safe approved replacement to consumers. In lobbying for a total ban, the manufacturers did not have any responsibility to consumers for the faulty and failing plastic parts; but instead stood to sell millions of new compliant cribs. The bottom line, we now have strict safety standards for cribs in the US, which went into effect in June 2011. All Full Size Cribs are required to be internal dimensions of 52 + or - 5/8" Length and 28 + or - 5/8" Width to fit a regular crib mattress of 51-1/4" x 27-1/4". Crib mattresses cannot be any thicker than 6" maximum, but can be thinner. The required measurement minimum between the top of the mattress base to the top of the crib rail must be 26". The CPSC states a child 35-inches tall or over should not use cribs, regardless the weight or age rating of the crib by the manufacturer. If a child is climbing out of a crib, it's time for a toddler bed. Falls are one of the major causes of injury for young children. Read more about Full Size Crib regulations here. Found at specialty baby boutiques, baby stores, big box stores and online; consumer cribs are readily available for immediate purchase. Most require significant assembly and do not have wheels. Some consumer grade cribs offer conversion from a crib to a toddler bed, and then from a toddler bed to either a day bed or a head board & foot board for a full size bed. These consumer cribs come in a variety of styles, colors, and even materials. Full size cribs vary in weight and age rating, therefore it is important to know the specifications of the crib you choose. Weight ratings can be between 40 - 70lbs depending on make and model. A child's age truly is not a good measure for determining crib safety. Businesses typically order commercial cribs from the manufacturer or a commercial distributor. Commercial cribs always have wheels, which make them compliant with commercial evacuation requirements. 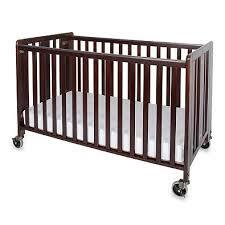 Hospitals, Hotels, Day Care Centers, Churches and Baby Equipment Rental services all use Commercial grade cribs. These cribs are either wood or metal, and some may have solid head board and foot board ends. Commercial cribs may or may not fold down to fit easily through standard doorways and for efficiency of storage. However, cribs must pass rigorous safety tests for strength and durability prior to approval for sale. The vast majority of commercial full size cribs include a weight rating of 50 lbs or more. Although, child height and activity level is a better factor in determining crib safety. This category encompasses compact or mini cribs, which are about one third smaller than a standard full size crib. Pack N Plays are not part of this category. Hotels favor these baby cribs, in addition to consumers with limited space. Mini cribs are an actual baby crib with a mattress, although smaller. These are appropriate for children up to approximately 20-months in age. Dimensions are normally 38" Length x 24" Width. Crib rail heights vary by manufacturer, but must be a minimum of 20" from the top of the mattress to the top of the crib rail. Weight limits on mini cribs are typically 35-lbs. Mini cribs are approximately the same size as a Pack N Play. To read more about non-standard regulations, click on this link. In conclusion, families and others renting baby equipment and cribs should be aware of the crib safety standards. 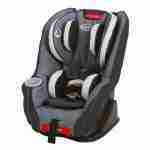 There are many reputable baby equipment rental companies that comply with all Federal, State and Local regulations. Warning signs to watch for are consumer grade cribs requiring on site assembly, versus commercial cribs which roll into place. If unsure about a supplier's compliance, ask to see the Certificate of Compliance for the crib which must be kept on file at all times.